One ladybug. Many friends. 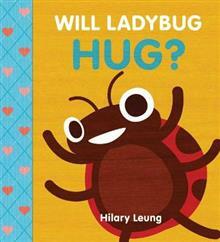 One timeless question: Will Ladybug Hug? Meet Ladybug. Ladybug loves to hug! Now Ladybug is getting ready to go on a trip and wants to say good-bye to her friends. . . but will her friends want to receive a hug? Find out in this surprising and memorable storybook all about friendship, high-fives, consent, and of course, hugs. A fresh and funny new book in creative talent Hilary Leung's series of animal question stories all about preschool milestone moments. Let Ladybug and her friends laugh, high-five, and hug their way to your heart! Hilary Leung is a Toronto-based designer and illustrator. Several years ago, Hilary self-published his first picture book, The Legend of Ninja Cowboy Bear. More recently he's worked on projects for Story Planet, a nonprofit organization that encourages young people to create and tell their stories. When not creating, Hilary can be found at home playing with his two awesome children. You can find out more about Hilary at hilaryleung.com.